Hello friends! If you enjoy stamping and Color Layering (using multiple layers to create one image) in particular, then you are probably like me – always on the lookout for perfect color combos. 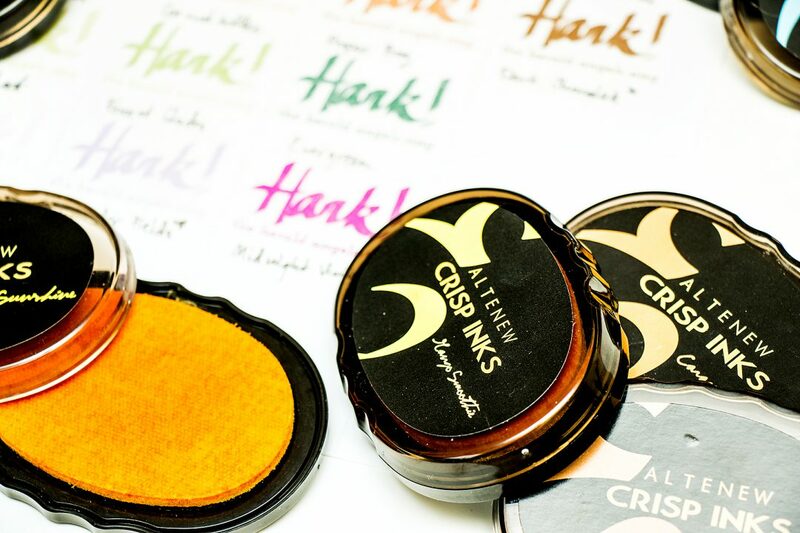 Altenew recently released several new ink colors and I’ve been eagerly waiting to receive them in my design team box so that I can update my ink chart, check out new combos and share them with you! I like Altenew’s ink for color layering in particular because they almost do not stain stamps. The darkest colors will stain very little; these inks are also very easy to clean up from stamps, there’s no need for special ink cleaner. 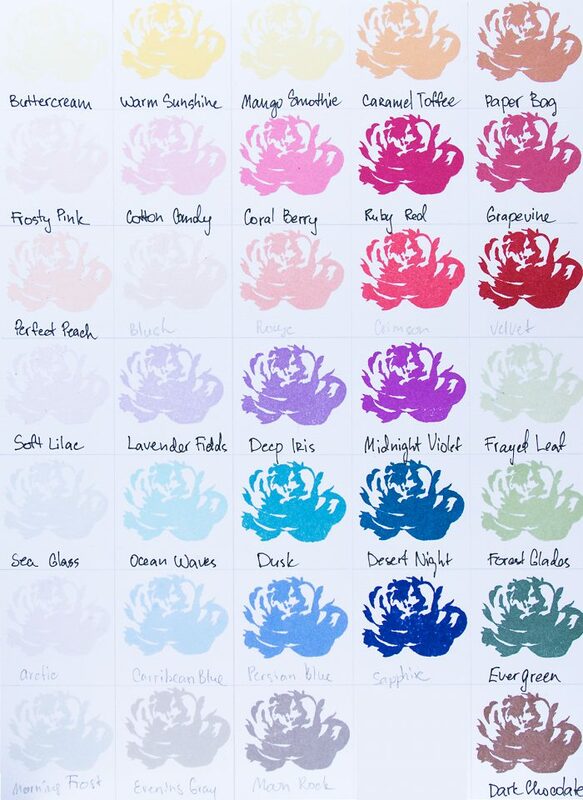 First I’d like to share the updated chart, I hope some of you will find it helpful, I know color charts like these help me a lot (usually when I’m doing my stamping), but if you are looking to pick up some new inks and wonder about the colors, this should be helpful as well. The only color that I am missing here is darkest gray, hoping to get it soon; the lightest colors here are a bit different from what they are in real life, it is quite hard to capture the true color on camera. Click the image below to enlarge it. The majority of these colors are released in groups of 4 making it very easy for stampers who enjoy multi layer images to create beautiful impressions (and Altenew also has mini ink cubes and full size ink pads in groups of four – I have large sets linked below). There are however a few colors (Mango Smoothie, Cotton Candy, Peach Perfect and Dark Chocolate) that are not a part of any set, but they still work nicely with other colors. GREEN FIELDS | this is a nice green, perfect for stamping leaves. If you want a lighter image you can start with the lightest gray, Morning Frost, and then use Frayed Leaf and Forest Glades. This gives a much lighter green combo. RED SUNSET | this is a beautiful peachy-red set. I want to try stamping flowers using the two lighter colors (Blush and Rouge) along with a Perfect Peach color from another set for a peach-colored flower. COOL SUMMER NIGHT | Fabulous teal color, very beautiful and warm. GLACIER CAVES | Also a beautiful blue, but its a cold blue. SHADES OF PURPLE | Nice purple combo, however the darkest color, Midnight Violet, is very vibrant compared to the 3 other colors, which seem more muted. RED COSMOS | The original red-pink combo, works great with new pinks, there’s an example of a flower stamped using Blush and Cotton Candy and other one using Cotton Candy in between the Frosty Pink and Coral Berry. SUMMER AFTERNOON | The original yellow combo, it works okay with the Mango Smoothie (the Warm Sunshine and Mango Smoothie do look very similar and aren’t always distinguishable on a layered flower) and also work great with Dark Chocolate (skip the first Buttercream). I also want to link to some of my older projects to share a closer look at some of these sets. I don’t yet have any cards featuring new inks, but I do have many using previously-released colors. Click the image to go to a blog post. Great post. So helpful for me to see the 4 layer rose. Thanks s much! This post is so great! And helpful for those who are struggling deciding which color to buy. Thank you so much for the Color charts. I have been deciding wether to invest in Altenew ink colours for some time and I must say, I think you just sealed it for me Yana. I love the colours and the way you have shown them. Thank you very much for the Colour charts. Most helpful. Great colour charts Yana.I don’t have any of Altenew’s inks yet as I have so many others but I def. will be trying them in the future. Thank you so much Yana for this wonderful post. 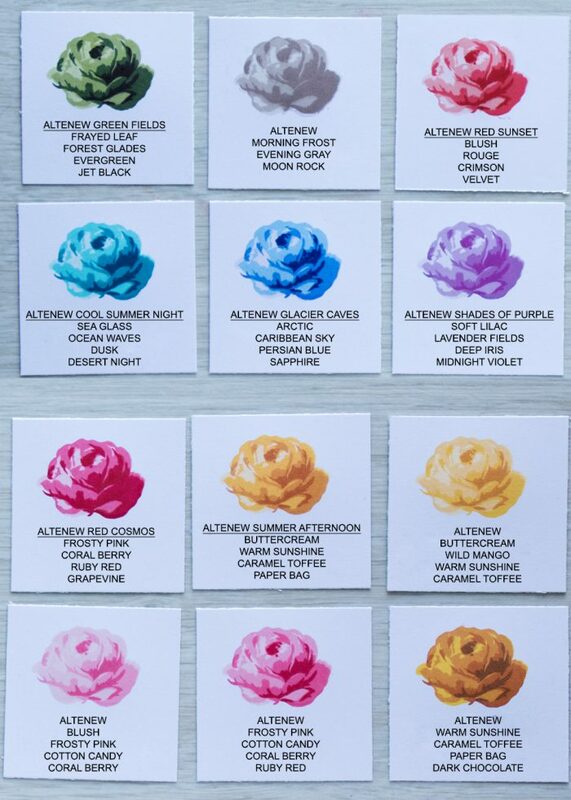 At the moment I do not have Dye ink, only Pigment ink, but with all these wonderful cards you make and that I can see on the other blogs, I ‘m seriously thinking about investing in some of them ! But they are so many on the market that I do not know which one to buy, which one is the best. I like the Altenew concept with their sets of 4 ink pad. Your color chart and your tips are so useful for beginners in stamp layering ! Thanks so much for sharing ! I am loving the colored layering stamp sets! Thanks so much for this wonderful color info! I have a mini set of Altenew inks in my favorite color range, purple. You have inspired me to use them and order more color combos! Thank you very much for those charts. They are soooo helpful. I was having a hard time trying to decide which of the reds I wanted….but this just helped me decide quickly! Thank You for a wonderful post! happy to help 🙂 enjoy your inks! вот ты пчелка!!!!! я прям в шоке)))) классная статья! хе хе 🙂 дякую, Свєта! A fantastic post to keep bookmarked as a reference. Such amazing colors and seeing them stamped out is so helpful! Now, I’ll just keep praying Altenew decides to offer reinkers! Thanks for much for this post, Yana! Wonderful resource! Thank you Yana!! This a such a helpful post…I have all the Crisp inks and am often be-fuddled as to which colors to layer. Your samples are beautiful and unique. Such a time saver:)) Hugs to you! !